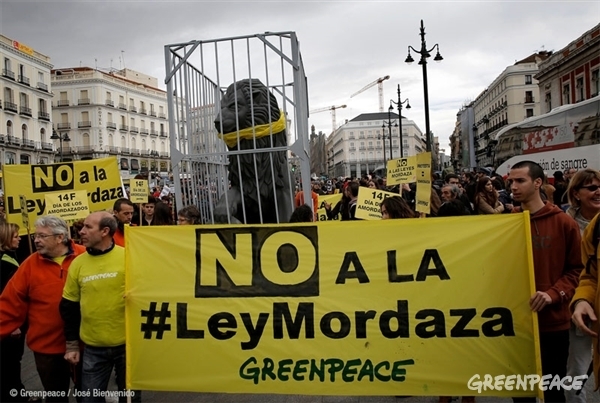 Greenpeace Spain found its agenda and goals threatened by fast-changing national politics. The organisation had to rethink how it worked with people. Something big was brewing in Spain. By late 2014, years of economic challenges and ineffective national politics had pushed new movements into power. All signs pointed at unprecedented changes in the country’s political landscape in the 2015 regional and national election. It was an opportunity for Greenpeace Spain to reorient itself and work with the public on broader issues connected to its core goal: protecting the environment for the people who depend on it. But opportunity did not come without challenges. The who and where of political power was moving. Meanwhile, a pure environment-focused message seemed less effective. 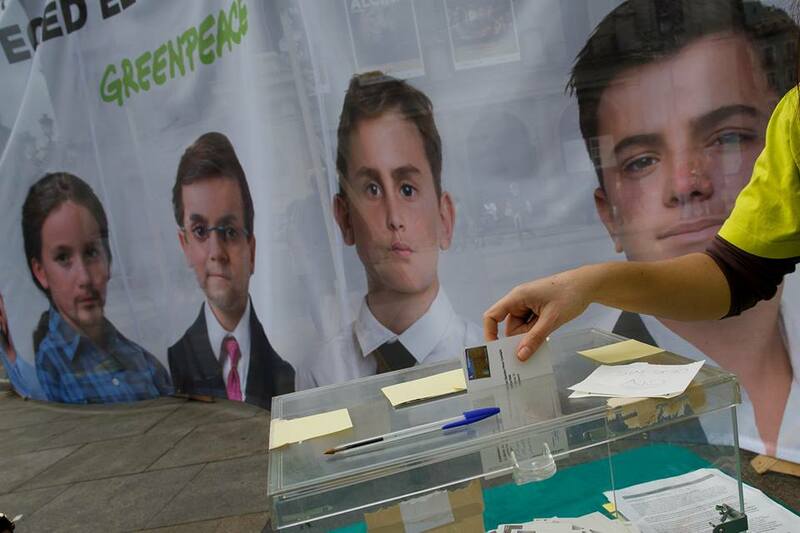 “Citizens are more concerned about corruption, unemployment and poverty than for the environment,” said Alicia Cantero, one of the leads on the electoral project at Greenpeace Spain. With unemployment at 25%, and concerns about corruption and poverty very high, it was hard to blame them. The organization would have to make a major shift in not only tactics, but how the organization ran campaigns and engaged with the public. A Greenpeace sign protesting political changes many viewed as harming the country’s democratic principles. “Usually our work during an election had a very low profile,” said Cantero. “A press conference to present our environmental proposals, and some lobby work, without any public campaign. 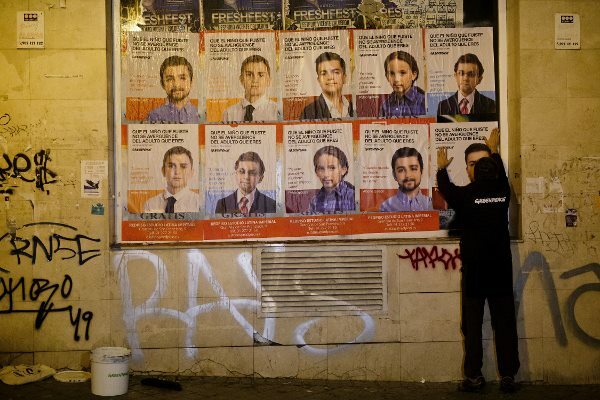 Greenpeace Spain saw two political parties gaining widespread support: the grassroots movement-based Podemos and the Catalonian right-wing party Ciudadanos. Both were openly disdainful of the political elite and what they saw as a biased Spanish media. Each party explicitly rejected the way the Spanish political system traditionally operated. Meanwhile, many rising leaders argued that environmental protection would have to be sacrificed for the sake of more salient issues, including jobs, poverty, and human well-being. Greenpeace Spain knew, however, that these concerns were interconnected, and that was the case they’d have to make to the Spanish public. 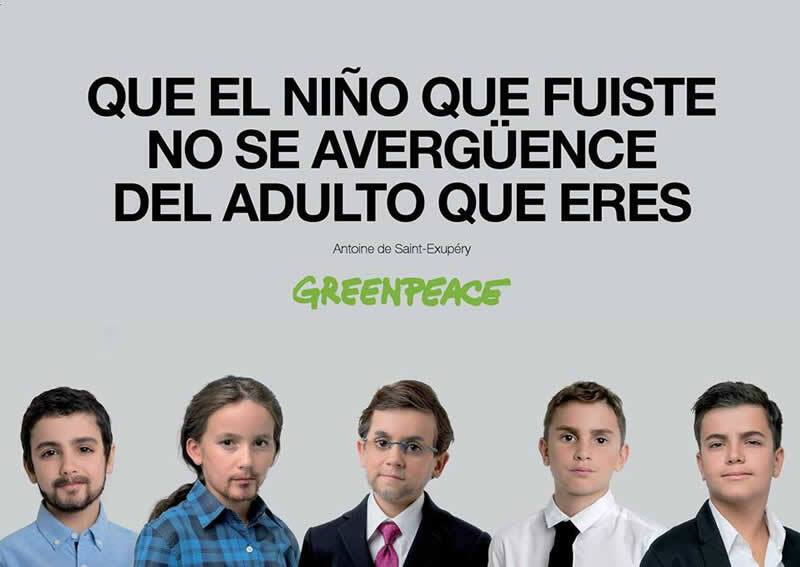 A Greenpeace ad invites Spanish people to consider the values of the country’s children using a quote from Antoine de Saint-Exupéry. shaped. An opening could be found working with people at the base of the political structure. 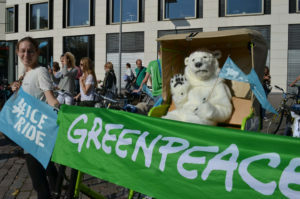 High level lobbying and popular pressure on leading politicians – the type of approach Greenpeace had used with traditional parties in the past – was less effective. This would be an experimental process, requiring Greenpeace Spain to engage with new partners in a more open, dynamic process, learning through experimentation, and actively decoding, analyzing, and responding. It was not easy to shift to a such a new system. The process began in 2014, and is still evolving today. The Spanish office was not working in a vacuum. The same shifts that had so dramatically impacted Spanish society had impacted Greenpeace as well. Lower donations, loss of staff, and, lastly, a realization that their political power had shifted created space for the staff to begin to engage society in a different way. Greenpeace Spain found that it faced an obstacle common in many organizations: long-standing ways of operating. Reframe ecology. Many, if not most, people aren’t focused solely on the environment. Connecting environmental degradation to other issues, particularly in times of economic hardship, helps engage new audiences and keeps supporters involved. Reframing environmental issues helped build new partnerships, as the wider messaging necessitated networking with other NGOs, some of whom Greenpeace Spain had little or no contact with in the past. Non-confrontation. Instead of confronting opponents, the campaign focused on values as the key to situating environmental issues into the national political debate. Don’t be afraid of failure. Good, well executed ideas can fail, and understanding that allowed for more open experimentation that allowed Greenpeace Spain to, ultimately, find project, ideas, and campaigns tactics that worked. Focus on Values. 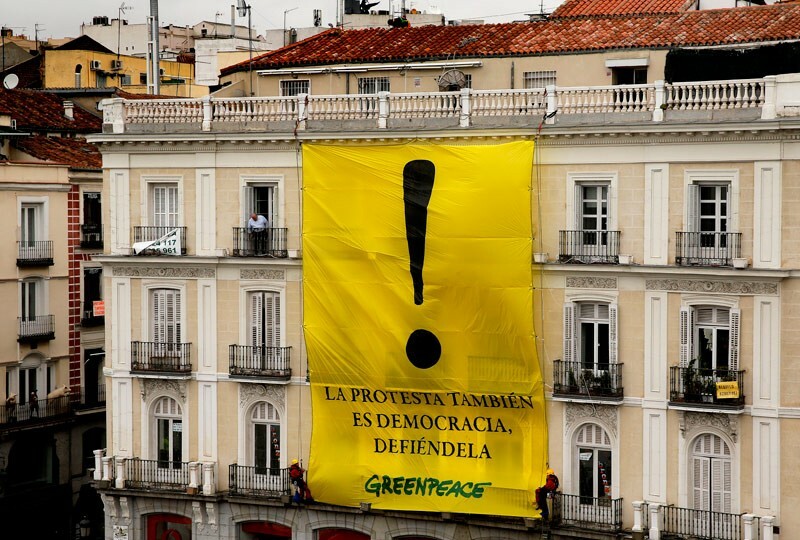 Instead of confronting targets with an overtly environmental message, Greenpeace Spain engaged supporters around important Spanish values, and connected to values to the environment through meaningful engagement. Once consensus was achieved, staff went through an in-depth process that included several workshops, strategy sessions, and opportunities for staff input driven from within Greenpeace Spain. The end result was something quite new to the team. In the new model, planning became less rigid and combined both clear prioritisation with a system of regular review to allow for adaptations in response to changing external circumstances. This allowed staff to test new ideas and the organisational patience to let longer-term projects evolve. Greenpeace Spain reached out to its supporters and allies to engage in these grassroots communities in an unbranded and open fashion. Activists tied environmental policy to values-based conversations and platforms. It was a big shift to trust volunteer activists with important advocacy roles, but the benefits outweighed the costs – greater collective capacity to reach political targets, and the cultivation of a more empowered, motivated activist base. Not all initiatives were a success. The Citizens Network, a local-level project to empower citizens to be participants in their municipalities, started strong, with 600 people signing up, but the impact ended up being far less than hoped. “It was a very good idea but it wasn’t successful, only three people actually acted in their municipalities,” said Cantero. However, following the new ethos, this failure did not take away from running the electoral campaign, and continuing to experiment with new ways. One of the projects that best demonstrates the new way of engaging was around the proposed Gag Law. When the establishment saw new political movements as a threat, they sought to stunt their growth by curtailing the ability of civil society and grassroots organizations to function within Spain. It was nothing less than an assault on Spanish freedoms and would criminalize protest, threaten the rights of Spaniards to freely meet and express themselves, even outlawing activities within the traditional Greenpeace arsenal, such as climbing buildings or non-violent direct action. 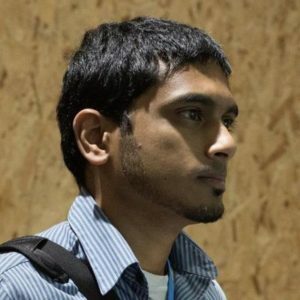 “It was easy to get consensus [to get involved] because the act had some articles specifically designed to target Greenpeace,” said Pablo Chamorro Ortiz, Offline Mobilisation officer for Greenpeace Spain. Still, it would be a shift – this was the organisation’s first campaign focused on free speech and democratic space issues. Greenpeace Spain built a cross-departmental team to figure out how best to make a contribution to the effort against the laws, eventually forming an alliance with several other Spanish NGOs, including Intermon Oxfam and Amnesty International. A scene from a Spanish protest against the proposed gag law. Photo by José Bienvenido / Greenpeace. Moreover, they forced the Government to react. Currently, the Gag Law has been modified due to public pressure, but its ultimate fate will come when the new Parliament is seated. Greenpeace Spain’s predictions were right – the new parties gained considerable support at the expense of the traditional parties. However, the fragmented Parliament was unable to form a ruling coalition, leading to new elections in late-June. The ruling center-right party emerged on top without a majority. Efforts to engage new parties in new ways—and around new issues—find Greenpeace Spain in a better position to engage with parties across the spectrum. “This Legislature wasn’t able to form a Government but it had a stronger, more plural and environmentally friendly Parliament,” said Cantero. Moreover, Greenpeace Spain now has allies with civil society partners who work on a broader range of issues, allowing the organization to engage with a wider segment of the Spanish populace.